Engagement Ring Trends for 2017, bridal trends offer a rainbow of colors! If you’re a traditional type of bride, nothing beats the iconic solitaire diamond engagement ring. But, maybe you are a person who wants to spice it up a bit or completely throw tradition out the window. Either way, you have come to the right place to hear the engagement ring trends for 2017! Recently, we have seen a growing demand for the untraditional modern engagement rings. Current bridal trends offer the consumer a rainbow of colors. You will also find some very uniquely shaped rings. Engagement ring trends have emerged from trendsetters and causes. Comfortable wear and unique style are never far from the modern bride’s mind. Whatever the priority, there is a perfect engagement ring trend to fit your personal taste. Blue sapphires, emeralds, and rubies… Chocolate diamonds, yellow diamonds, and onyx stones… These are some of the choices as you envision your perfect ring. White diamonds are no longer the go-to for bridal jewelry. 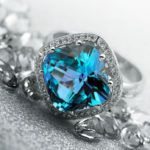 Currently, blue precious stones are a huge engagement ring trend in America. Princess Diana is remembered for many things, least of all her famous oval sapphire ring. Prince William presented his mother’s blue engagement ring when he proposed to Kate Middleton, who is now known as Catherine, Duchess of Cambridge. 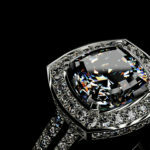 The daring bride-to- be who style is on the dark and edgy side might consider a black diamond ring. Black diamonds set against white diamonds in a white gold setting makes for a striking combination. 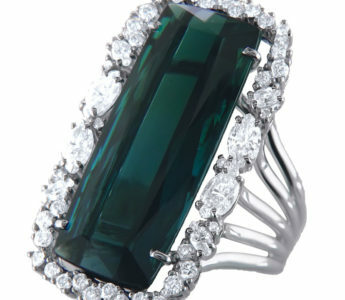 If the traditional diamond or colorful gemstone ring doesn’t make you swoon, there’s still another way to go. Discover an emerging trend of engagement rings that feature the elegant pearl. It has timeless classic feel while still maintaining a statement stone status. This ring is a great example of trendy black diamond engagement ring style. Engagement ring trends go beyond just the color of the precious stones you choose. Here is an angelic twist on a classic setting! If you love the look of a traditional solitaire engagement ring but prefer something more dramatic, look into the bold halo engagement rings styles. 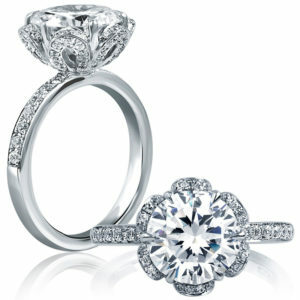 These rings are designed with a halo around the solitaire diamond to make the beautiful stone seem much larger. This engagement ring trend is creating unique and amazing halos. Some may look like snowflakes, while others may appear to be floral. The Statement Diamond Petal Engagement Ring is a sweet and feminine example of the bold halo trend. 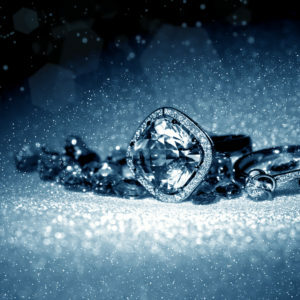 You can select a setting that has channel diamonds or pavé. Unlike a solitaire, these ring styles allow for the addition of other rings as you journey through your marriage (or career accomplishments). These can be stacked with other rings to represent the unique journey you have lived. Different stones can represent different points of your journey or important people or dates. Sometimes the adage, “Less is more”, doesn’t fit your personality. If you are someone who likes a little more than just one statement stone, look no further. The side stone engagement ring trend and the three stone engagement ring style are really great options for you! Adding multiple stones to your ring shows that you are not afraid to go big and you will get tons of extra sparkle. Another engagement ring trend is a band with an atypical shape. 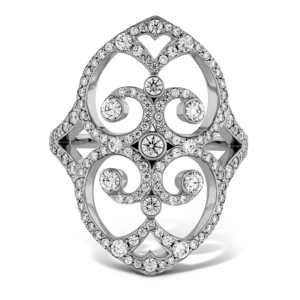 Rather than going with a traditional round band, go wild with a lengthwise shape. Not only does this unique band stand out from the traditional, it’s very flattering especially on long fingers. 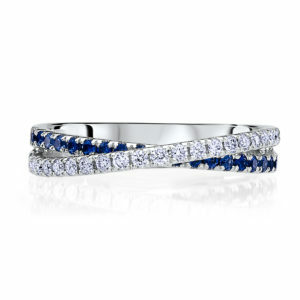 This easy to wear ring by Scott Kay fits in with the blue sapphire trend and the pavé style diamond trend. 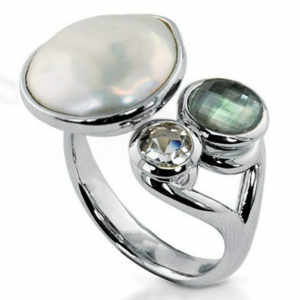 This white gold and mother of pearl ring is an example of the statement pearl engagement ring trend. This ring is a great example of an atypical shaped band style to play with the dimensions of the ring. 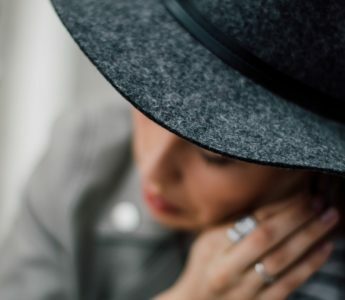 As you peruse through current engagement ring trends, think over some of these scenarios: Will you want a coordinating wedding band to wear alongside of your engagement ring? If yes, then an atypical lengthwise engagement ring may not be for you. Perhaps consider a pavé or colorful statement stone. You should also think about whether you and your partner would like matching elements in your rings. Is it important to you that both rings are made from the same metals or gemstones? You might like the idea of a wedding band for him that matches back to your engagement ring and wedding band set. If so, keep this in mind as you’re looking. No matter your style, the engagement ring trends will lead you to the perfect modern ring. There is no shortage of fashion forward styles to choose from. Soon you will be saying “YES” to the perfect ring!